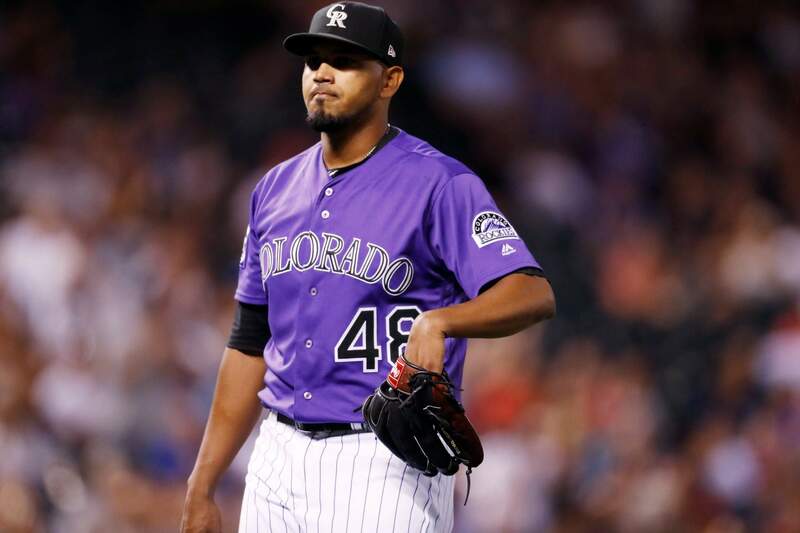 Colorado Rockies starting pitcher German Marquez reacts after striking out Arizona Diamondbacks’ Steven Souza Jr. to end the top of the sixth inning of Monday night’s game in Denver. DENVER – In a sixth-inning jam, German Marquez received a visit from his manager and a little advice: Don’t do too much. Stay in the moment. Execute. Marquez’s confidence level is at an all-time high. Still, Black had a little talk with him in the sixth – just to settle him down. It worked as he struck out Steven Souza Jr. to end the threat. DESMOND MILESTONEOn Sept. 10, 2009, with Washington, Ian Desmond made his major league debut. On his nine-year anniversary, he hit a double to lead off the fifth and start the big rally. GOOD BUDDIESArenado remembers competing against Goldschmidt in 2009 when he was at Casper of the rookie league and Goldschmidt with Missoula. FAMILIAR NAMEMarquez said he knows Astacio, who offers Marquez advice from time to time. UP NEXTDiamondbacks RHP Zack Greinke (13-9, 3.08 ERA) faces a Rockies team Tuesday night he’s beaten twice this season. The Rockies will throw RHP Antonio Senzatela (4-5, 4.92).